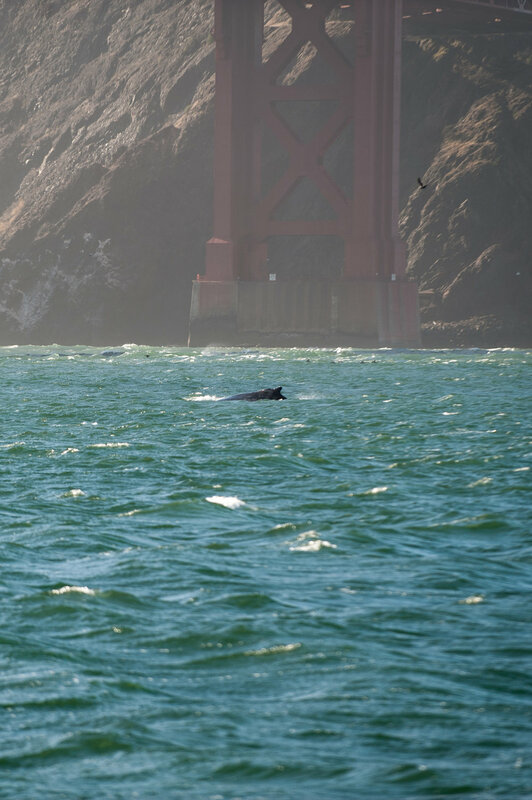 We found our first whale of the day under the center span of the Golden Gate Bridge. We saw several fluke dives as the whale moved back into the middle of the Golden Gate Strait. Humpback fluke under the bridge. The whale was diving in 300+ feet of water, and the dives were longer than average. We saw a small amount of fish on the sonar. Humpback in front of Baker Beach. We had very calm water for this trip. We had a man overboard drill and picked up a plastic bag floating near the bridge. We sighted many harbor porpoises with their calves as well as harbor seals and sea lions. As we headed out past the Golden Gate Bridge, we thought we saw a big splash near Mile Rock. We headed towards it, thinking it was a breach. We didn't see any spouts, so we continued north towards a large group of birds feeding on Four Fathom Banks. The birds were diving on the tide line; the group was mostly composed of western gulls and common murres, with a few Brandt's cormorants nearby. Birds feeding on the tide line. We found a spout nearby and followed it to a humpback whale feeding in 30 feet of water. We followed the whale through the Potato Patch. We didn't see any fluke dives due to the shallow water. The whale surfaced twice into large groups of birds. At one point it rolled onto its side and we saw the pectoral fin and one lobe of the fluke. Whale surfacing in a large group of birds. We saw lots of harbor seals and harbor porpoises and passed a western gull with a bullhead in its beak on our way back in.